For the aspiring musician or the serious player, this DVD collection is ideal. 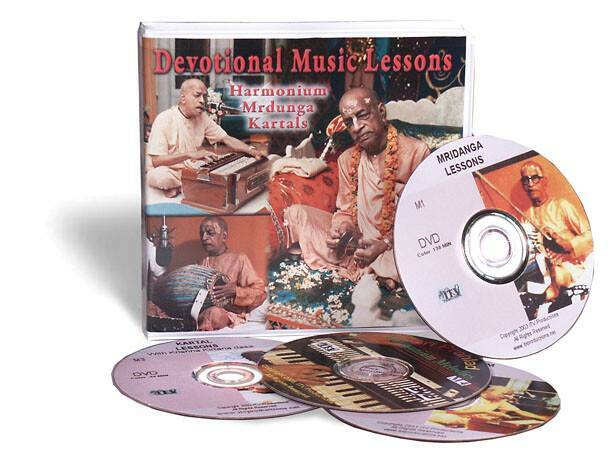 These great instructional DVDs will teach you to play three classic Indian instruments: mridanga (drum), harmonium (hand-pumped organ), and karatals (hand cymbals). Nine lessons beginning with rudimentary scales to progressively more intricate exercises will have you playing bhajans of the great masters in no time. Also on this video, Sunanda Dasa teaches famous VISHNUJANA MELODIES. Color 132 minutes. Bangladesh's premier kirtan musician demonstrates the proper techniques for creating complimentary rhythms and sounds on these hand-held brass cymbals. Color 40 minutes. Expert rhythm masters, Krishna Kirtana Dasa and Nityananda Prana Dasa demonstrate the art and science of playing this clay drum. Color 110 minutes. Our own Sri Prahlad dasa, famous for his transcendentel renditions of the Hare Krishna mahamantra and other Vaisnava songs, shares over 50 of his favorite tunes in an over-the-shoulder demonstration of the melodies. You can easily learn how to play them, and each melody is authored as a separate chapter for easy reference and repetition.